No.1 Powland Way, Glen Lorn,Harare, Zimbabwe. Republic of Zambabwe Harare King George Rd.110. Click on the entries to get more infos. ALLEN & BRYANS CONSULTANTS (INT’L) PTE LTD.
BARRINGTON INVESTMENT & FINANCE LTD.
C & C INTERNATIONAL SERVICE CO., LTD.
Esternbridge Hightech Systems Holdings Inc.
Excel Investment Group Holdings Inc.
GOLDEN POWER COMPUTERS HOLDINGS LTD.
HUNTINGTON HOLDINGS INTERNATIONAL CO. LTD.
LATIN AMERICAN MARKETING STRATEGIES LTD.
Lemius Invest & Finance Corp.
Mingwei Capital Investment (I) Ltd.
Pacific Capital Investment Management Ltd.
RESEARCH & DEVELOPMENT GROUP LTD.
Shining Glory Financial Holding S.A.
YSP OVERSEA INVESTMENT CO., LTD.
Pierce, Fenner & Bean, Ltd.
3rd Floor, Omar Hodge Building, Whickhams Cay I, P.O.Box 362, Road Town, Tortola, British Virgin Islands. 6200 Frydenhoj Estate, Ste. 4, St. Thomas, USVI 00802. Drake Chambers, Tortola. Briitish Virgin Islands. First Floor, Yamraj Building, P.O.Box 3387, Road Town,Tortola, Bristish Virgin Islands. P.O. Box 3321, Drake Chambers, Road Town, Tortola. Bristish virgin Islands. P.O.Box 173 Kingston Chmabers, Road Town, Tortola. Bristish Virgin Islands. P.O.Box 26363, Christiansted,St.Croix, VI 00824-2373. P.O.Box 3152, OMC Chambers, Road Town, Tortola, Brityish Virgin Islands. P.O.Box 3321, Road Toen ,Tortola, Bristish Virgin Islands. P.O.Box 3387, Road Town,Tortola, Bristish Virgin Islands. P.O.Box 3444, Road Town,Tortola, Bristish Virgin Islands. Vanderpool Plaza, 2nd Floor, Wickhams Cay 1, Road Town,Tortola, Bristish Virgin Islands. 93-A1 Caugiay Street, Hanoi, Vietnam. Hanoi Vietnam,126, Hoang quoc viet Road. Room 403, TORSECO Building, Van Phuc, Ba Dinh, Ha Noi, Vietnam. 3ra.Avenida De Los palos Grandes, Apt.72,Urb.Los Palos Grandes, Caracas, Venezuela. AV.Los Bucares, Las Palmas, Venezuela. AV.Los Bucares,Res.Orinoco, Piso 4,Apt 4,Las Palmas, La Florida Caracas, Venezuela. Av.Los Bucares,Res.Orinoco,Piso4, Apt 4,Las Palmas,La Florida Caracas, Venezuela. Berquisimeto, Estardo de Lara, Venezuela. Calle 7 Qta ,Trapisonda La Boyera, Edo.Miranda, Venezuela. Calle Oriente ,Qta. Villajjoyosa,Urb. Alto Hatillo,Caracas, Venezuela. Panorama Nr.15 Av. Principal Los Naranjos Caracas ZP 1061, Venezuela . Res.La Arbolada,Apt.122B.1 era. Av.De Santa Eduvigis Urb. Sebucan,Caracas, Venezuela. The World Drug Report provides an annual overview of the major developments in drug markets for the various drug categories, ranging from production to trafficking, including development of new routes and modalities, as well as consumption. 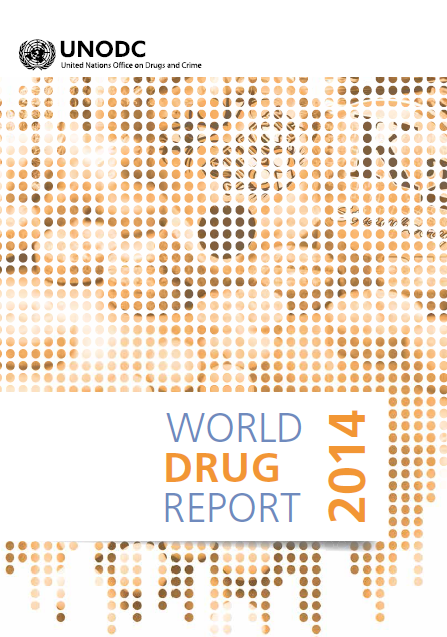 Chapter 1 of the World Drug Report 2014 provides a global overview of the latest developments with respect to opiates, cocaine, cannabis and amphetamines (including “ecstasy”) and the health impact of drug use. Chapter 2 zeroes in on the control of precursor chemicals used in the manufacture of illicit drugs. On the basis of comprehensive information on supply, as well as the relatively limited new information on demand, it can be concluded that overall the global situation with regard to the prevalence of illicit drug use and problem drug use1 is generally stable, with the total global number of drug users increasingly commensurate with the growth of the world population. That said, each region exhibits its own peculiarities with respect to specific drugs. Polydrug use, which is generally understood as the use of two or more substances at the same time or sequentially, remains a major concern, both from a public health and a drug control perspective. The global area under illicit opium poppy cultivation in 2013 was 296,720 hectares (ha), the highest level since 1998 when estimates became available. An increase in cultivation was seen in both Afghanistan and Myanmar. 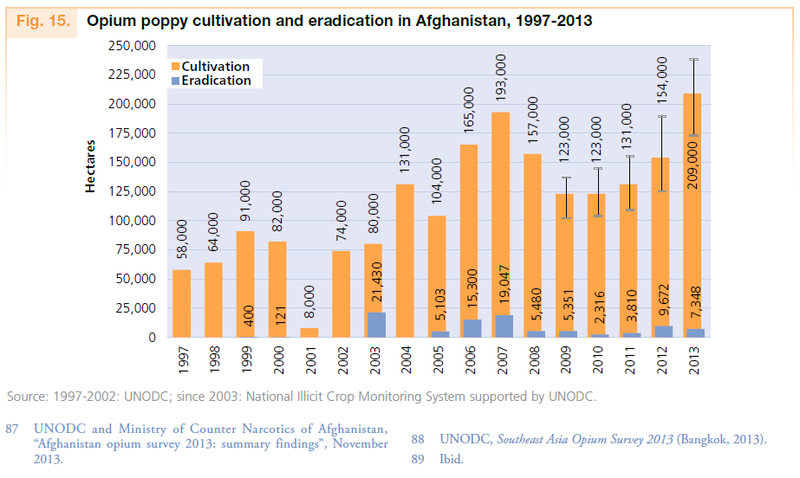 The main increase was observed in Afghanistan, where the area of opium poppy cultivation increased 36 per cent, from 154,000 ha in 2012 to 209,000 ha in 2013. The main area of cultivation in Afghanistan was in nine provinces in the southern and western part of the country, while the major increase was observed in Helmand and Kandahar. In Myanmar, the increase in the area of cultivation was not as pronounced as in Afghanistan. In South-East Asia, the total area under cultivation in the Lao People’s Democratic Republic in 2013 was estimated as 3,900 ha (range: 1,900-5,800 ha). However, the 2013 estimates are not comparable with the estimates of 2012 due to the varying methodology in the use of high-resolution satellite images and time of conducting the helicopter survey. Myanmar continued the trend of increasing cultivation that began after 2006.89 (See tables in annex I for details on opium poppy cultivation and production in the different countries and regions). The potential production of opium in 2013 is estimated at 6,883 tons, which is a return to the levels observed in 2011 and 2008. The opium production in Afghanistan accounts for 80 per cent of the global opium production (5,500 tons). The potential production of heroin (of unknown purity) has also increased to 560 tons, comparable to 2008 estimates of 600 tons (see figure 16). Although global supply and demand may be evening out globally in the long term, the illicit market for opiates is far from static, especially when shorter-term trends are taken into account. There is growing evidence of significant changes in the flows of heroin out of Afghanistan, of heroin from Afghanistan becoming more available in consumer markets other than the long-established European destinations, and of the interplay between the illicit and licit markets for opioids (including opiates). It appears that the flow of heroin along the long-established Balkan route, from Afghanistan to Western and Central Europe via Iran (Islamic Republic of ) and Turkey, has declined in recent years. Various factors may have contributed to the decline in seizures along this route, including the success of law enforcement authorities in key transit countries and a decline in demand in the destination market. Based on UNODC estimates, the number of past-year users of opiates in Western and Central Europe may have declined by almost one third between 2003 and 2012 (from 1.6 million to 1.13 million). This is also observed for example, in the data from Germany, where the number of people arrested for the first time for heroin use fell steadily between 2003 and 2012 — overall, by more than one half. Even so, in 2011 and 2012, there may have been a certain deficiency in the available supply of heroin (which may yet be corrected), as the purity-adjusted price of heroin underwent a distinct transition between 2010 and 2011, and maintained the increased level in 2012. Indeed, the decline in heroin flowing on the Balkan Route appears to have been too sudden to be accompanied by a corresponding drop in demand. The ensuing shortfall may have helped trigger the development of routes serving as alternatives to the Balkan route — whose emergence is suggested by other evidence — to supply Europe, possibly via the Near and Middle East and Africa, as well as directly from Pakistan, suggesting that the so called Southern Route is expanding. L & M Consulting Ltd.
NEW ASIA DEVELOPMENT HOLDINGS LTD.
1st Floor, Pacific Building, Port Villa Vanuatu. First Floor,Pacific Building, Port Vila, Vanuatu. GT Group Limited PO Box 1487 Level 1, Bougainville House Rue Bougainville Port Vila Vanuatu. Level 2,Bougainville House, Rue Bougainville, Port Vila,Vanuatu. P.O.Box 1487, 1st Floor,Pacific Building, Port Vila, Vanuatu. PO Box 1487 Level 1, Bougainville House Rue Bougainville Port Vila Vanuatu.